Remember the days when sitting in the barber’s chair was just a case of saying ‘short back and sides’ and picking out glasses offered the choice of plastic or metal? Well, as good as they were, those were also the days your ‘do gave you ears like Dumbo and your specs could double up as replacement bin lids. Today, any man worth his salt in the style department needs to understand the shape of his skull and how that affects what he can (and cannot) pull off. John Lennon frames on a round face? Nope. Skin fade on a diamond? Think again. If all of this makes as much sense as taking a vegan to Nandos, read on for our fail-safe guide to finding out how you measure up in the facial department. Sure, you’ve probably got a builder’s tape measure knocking about somewhere, but good luck wrapping that rigid piece of metal around your head. To make things easier (and more accurate) arm yourself with a flexible tape measure, like the kind used by a tailor. Then, grab a notebook and in front of a mirror take the following measurements, recording each as you go. In order to work out which face shape you have, you need to find out which parts are long, which ones are short or whether they’re actually all the same. The forehead is a good place to start, so measure across the widest part – this is usually around halfway between your eyebrows and your hairline. The width of your cheekbones is especially important when it comes to picking a hairstyle. Getting it wrong can throw features like your ears way off proportion. Size yours up by placing the tape across the pointiest part, just below the outer corner of each eye. Even if you’re built more like Jonah Hill than Henry Cavill, there’s a jaw line in there somewhere. Measure from the tip of your chin to below your ear at the point at which your jaw angles upwards. Of course, you have a jaw on both sides of your face so multiply that number by two to get your jawline length. What’s the difference between a rectangle face and a square face? About two inches. That’s not a joke, it’s true. To find out the length of your face, run the tape measure from the centre of your hairline to the tip of your chin. 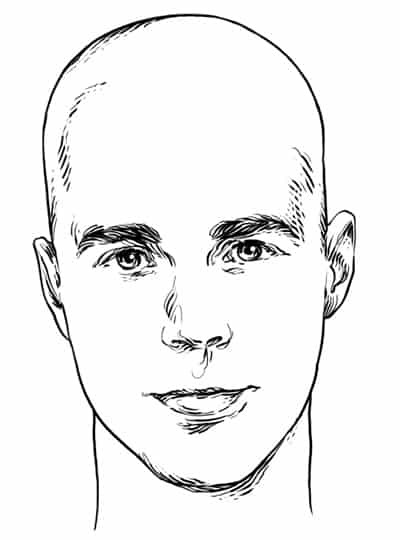 For follicularly challenged men with either shaved or bald heads, estimate the point where your hairline would be. Once you’ve got these measurements, note which is the largest of the four as this will be the giveaway. Compare your stats to the profiles below to see which best describes your face shape. Oval: Face length is greater than the width of the cheekbones, and forehead is greater than the jawline. The angle of the jaw is rounded rather than sharp. Square: All measurements are fairly similar. The angle of the jaw is sharp rather than rounded. Rectangle/Oblong: Face length is the greatest measurement. Forehead, cheekbones, and jawline are similar in size. Round: Cheekbones and face length have a similar measurement. They are larger than forehead and jawline, which also have a similar measurement. The angle of the jaw is soft and much less defined. Diamond: Face length measures largest. Then, in descending order: cheekbones, forehead, and smallest is jawline. The chin is pointed. Heart: Forehead measures greater than the cheekbones and jawline. The chin is pointed. Triangular: Jawline measures greater than cheekbones, which measure larger than forehead. Once you’ve figured out your face shape, you can begin to make more informed choices on everything from your hairstyle and beard to your sunglasses.